A brilliant match last Wednesday for our Ladies team as they drew with Man O War in a match for the ages. We can also confirm that Mick & Willie Wogan are still on talking terms after the game. The Ladies team role on their league campaign with a match at home vs Blessington at 6.30pm. All support welcome. Our Mens teams kickstart their Championship Campaigns this weekend (Sat & Sun April 13th & 14th). The 1st team play at home to St Margarets at 5pm on Saturday. The 2nd team play Sunday away to Clontarf GAA at 11am. Great work by the Community Response team who organised a very succesful Mental Health morning in the National School last Saturday morning. Lots of information for parents, grandparents and young people. If anyone needs to talk, please dont hesitate to get in touch with a club mentor who will direct you in the right direction. Our G4M&O team will play a match tonight (Monday April 8th) in Boughal at 7pm. Best of luck guys. Great matches all weekend with the St Peteres Boys U.14 team beating Na Fianna in Boughal. Great talent on display. The St Peters U.12 boys also had a great game vs Donabate but narrowly lost in the end. 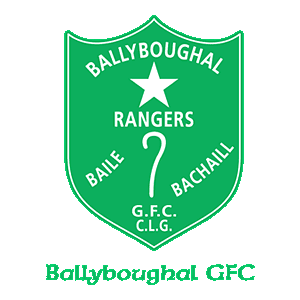 The future of Ballyboughal looks very promising! New jerseys sponsored by Kieran Bros.
Special mention to our G4M&O team who raised and donated €1,000 to Jigsaw North Fingal last Saturday morning. A great cause, raised by the ladies after completing the 2,500km walking challenge in January. E-Shop World are the proud sponsors of Ballybougal GFC. A great sponsor with very supporting people.